We will pick 4 photos on 11-30-2012 midnight EST and repost them. The reposted photo with the most likes after 24h will WIN. The winner will receive a $0.99 app of their choice from the AppStore. Winner will be notified via Instagram. Entries are accepted until 11-30-2012 midnight EST. Congratulations to @vitpayne @helenagustine @brendan__k and @ddjeter01 our selected candidates for the Win Free App Contest!!! The candidate's reposted photo with the most likes at 11/27/12 midnight EST will win. Please vote for your favorite photo by liking the reposted photos. Good luck to all candidates. 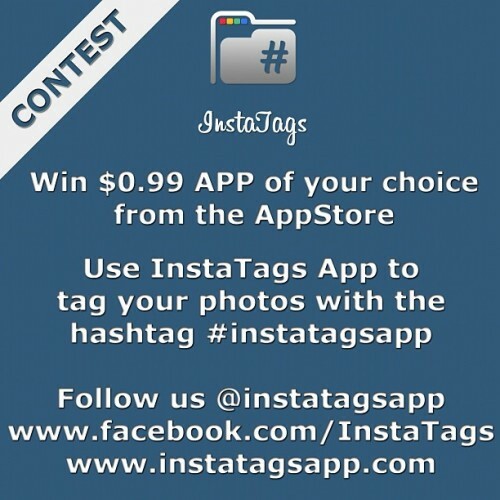 Follow us @instatagsapp for upcoming contests. We will pick 2-4 photos for the day and repost them. The reposted photo with the most likes within 24h will WIN. The winner will receive a $0.99 app of their choice from the AppStore. Winner will be notified via Instagram. Entries are accepted until 11-26-2012 midnight EST. Update: New Version is out on the AppStore, click here to get it. The new Instagram SPAM filter is deleting InstaTags - Hashtag Manager posts. To resolve the issue remove "powered by @instatagsapp"
Your tags will be posted as normal. We are working on fixing the issue on our next app release. We are aware of the issue and are working to fix it. Due to the recent hurricane in the US we are experiencing issues contacting Instagram and Apple to expedite the issue. Please be patient. A new version will be available soon from the App Store. Instagram support is looking into the OAuth issue as well. InstaTags - Hashtag Manager (v1.0.2) is out on the App Store!!! The Site uses Google Anayltics software. This may place cookies in your browser. InstaTags uses Instagram's public API. InstaTags is not affiliated with or endorsed in any way by Instagram™ or their affiliates. InstaTags does not have any business relationship with Facebook™.